New Orleans music, vocals, acoustic guitar, trumpet and bass. The sound of life flowing by in a song. 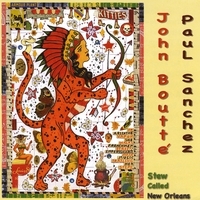 Stew Called New Orleans, a duo record with good friends and song writing partners, John Boutte' and Paul Sanchez. These eleven songs represent the cultural and musical "Stew" that their friendship has been and the song choices reflect that influence on the disc. The friendship is audible in the performances on this recording. Done live, in one day, at Piety Street Recording in New Orleans recorded by the very gifted Mark Bingham who really captured the relaxed feel of the music and the musicians. One of the songs, Two-five-one, was co-written by Sanchez and the great New Orleans trumpet player Leroy Jones along with acoustic guitar master, John Rankin. Todd Duke, Boutte's long time guitarist wrote a song with Sanchez that Boutte' sings, Don't Smoke Around Susie. Check out this Stew Called New Orleans.